Deflections - Congratulations High Performance Coach! A.K.A. Expert and Highly Competent Coach! There exists a hockey forum website which has comments about the worth of the high performance coaching seminar, especially for those who played pro hockey and wish to coach minor hockey. Now that AAA (bantam and older) and junior coaches in Canada need High Performance 1 coaching qualifications, the debate about its worth has been reignited. On that site, there was one fellow who whined he got more out of the evening beer ‘n’ bull sessions than the clinic itself. Someone else ranted about ex pro major junior coaches who aren’t allowed to coach their kids in AAA because of the rule. Then there was the ignorant and baseless argument that these seminars are little more than cash grabs for the host area. I wouldn’t suggest then that the handful of comments were a representative sample of opinions from across the country. Nevertheless, this argument won’t disappear for a few reasons. For one thing, the Canadian hockey culture is not built on the notion that coaching is a learned and trainable skill. Unlike in other parts of the world, particularly Europe, coaching hockey (or any sport) requires training and education. Not here. To many of a certain ilk, if you’ve played, you can coach. 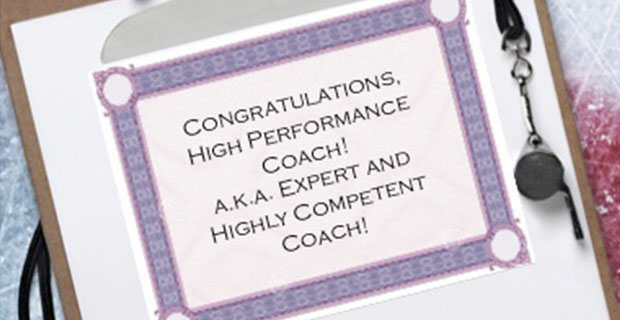 As well, people - quite mistakenly - equate coaching certification with competence. It’s rubbish. While the High Performance seminar and evaluation process are extensive, they aren’t just make-work projects. They’re designed to help coaches learn the value of planning, self-evaluation, and examination of options for their teams, not to mention addressing the myriad of issues and problem-solving situations coaches face daily. I’ve been involved with about a dozen HP seminars and have yet to meet a bad coach who suddenly became competent by attending. Nor have I seen a decent coach become terrific because he got 90% on the assignments. Indeed, some see the HP as a hoop to jump through rather than a means to improve one’s coaching skills. But you can’t change attitudes easily. The former pro who sees his own experiences at the game’s pinnacle as being all that is necessary to coach is not doing himself nor his players any favours. Just try to change his mind. A number of NHL coaches have taken the accreditation courses: Pat Quinn, Mike Babcock, Bob Hartley, Dave King, Ken Hitchcock, Tom Renney, to name a few. Would they have still been coaching in the NHL without them? Yes. However, as professional coaches, each would state that the extra education they received in these courses helped. In fact, some have been quite public about it, particularly King, Hartley, Babcock and Renney. At a minimum, the HP experience provides coaches more tools to work with. Those who attend as if in chains, regarding it as a few days lost they’ll never get back, don’t get it.